Pamela Z has confessed. She owns a viola. She told us as much at the start of Sunday’s “Longer Burning,” the latest in her years-long ROOM series of chamber concerts. She played viola as a child, and the instrument is still in her possession. Rather, the case is. It’s apparently been years since she’s verified that the viola is still alive. 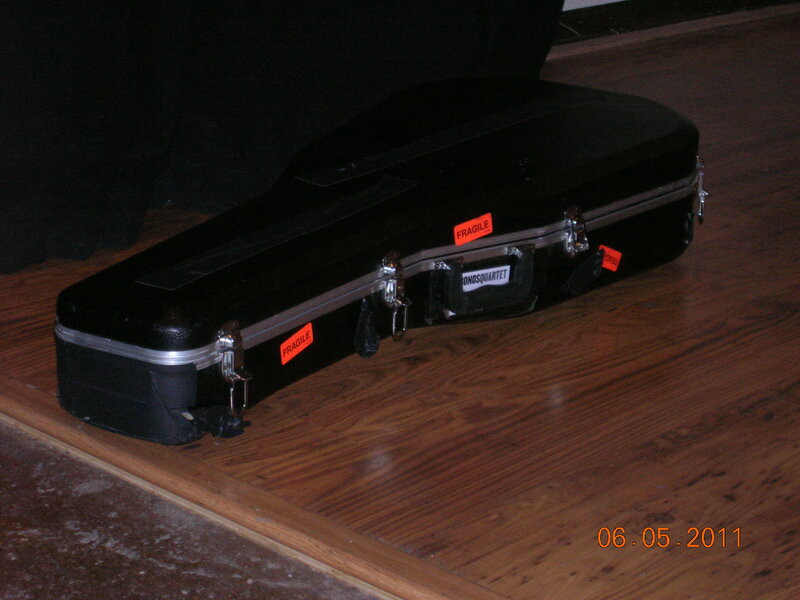 Schroedinger’s viola. Several of the ROOM concerts have focused on one instrument or class of instruments — flutes, percussion, bass, voice — and Pamela Z has apparently been trying to get a viola version together for years. She did well, recruiting players who presented a wide range of styles. His other two pieces were acoustic. “Calligraphy No. 5” was written by Reza Vali as a modern piece that uses a traditional Persian scale that to Western ears sounds, well, Persian. For Western ears, that meant a mixing of the familiar and the new, a soaring and very engaging piece. Lee closed with “Insistence” (Matthew Cmiel), an athletic piece that kept returning to an almost bluesy little phrase. Really nice, with a rhythmic middle that calls for the performer to tap his foot (or maybe Lee was just getting into it). Jhno performed next, as mentioned below. As often happens in electronic music, his piece developed in patient layers, and he’d just laid down the foundational colors before being interrupted. Hank Dutt of Kronos Quartet presented what I suppose was the most conventional set of pieces, but it still wasn’t conventional conventional. He started with the Bach-influenced “Solo Based on Courante” by Nils Bultmann. Very Bachian, in statements formed by long chains of notes. I was fascinated by one element of Dutt’s technique here. Maybe I just don’t see enough classical music up close, but many times, I noticed he started notes without friction, with none of the tiny crunch or grind that’s inevitable in more aggressive bowing. There was just air, as if he were coaxing the viola into breathing the tones. Like Lee, Dutt took a “world music” turn, picking India as his destination, and a segment called “Alap” from “Raga Mishra Bhairavi,” by Ram Narayan. He closed it out with “Waiting,” a solo looping piece from Joan Jeanrenaud‘s album, Strange Toys. It’s a pretty piece that builds one phrase after another over a two-chord pattern, culminating in a dramatic credenza. Pamela Z followed with a solo improvisation — a collage for samples, voice, and processing, where the samples came from the piano in her practice room during a Montalvo residency. She triggered these with hand motions in front of a sensor, a jangly little breakdown of noises matched against her voice’s soprano notes. The program ended with Pamela Z, Dutt, and Lee in a group improvisation. They started tentatively, building from staccato fragments, and later meshed into some longer, gorgeous tones.